Paytm Meru cab offer in which you can avail flat Rs. 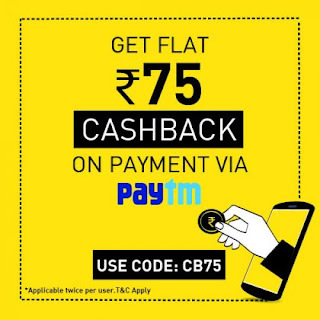 75 cashback when pay through paytm wallet. Meru Cabs is the pioneer and market leader in the personal road transportation business in India. So just book cabs from meru and pay via paytm to avail the cashback offer. This offer is valid for users of Meru Radio Taxi, Meru Sedan, Meru SUV & Meru Hatchback. This offer is applicable on Meru mobile app and all Airport/Kerb trips. For all Airport/Kerb trips paid via Paytm with Payable fare above Rs.400 will be given flat Rs.75 Cashback. No need to tag code but, Customer has to tag his/her Cab Number in Airport/Kerb payments section via Meru App and pay the fare via Paytm. The minimum payable fare amount should be Rs.400. This Offer is valid for 2 times per user in cities where Meru is operational. Cashback will be auto-credited to user’s Paytm wallet within 4 working days by PayTM. This is a limited period offer, valid till 30th November, 2017 midnight and may be withdrawn anytime without any prior notice.